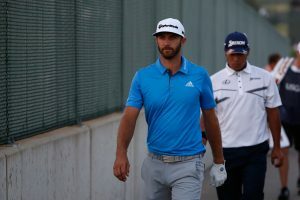 From Dustin Johnson to Tiger Woods, to Brooks Koepka, to Rory McIlroy, or pretty much any of the new breed of golf pros- it’s impossible not to acknowledge the role fitness, and, Yes, even muscle building play in today’s game of golf. With the state of golf fitness these days, there are no more excuses you can throw at us golfers for not getting and staying in excellent shape. There are only benefits to being a fitter golfer and human. Surely, there are fat people that play golf well. There’s no denying that, but you can’t tell me a fat- out of shape guy with a gut won’t hit the ball equally farther and at least as solidly if he drops that gut and gains strength, range of motion, and flexibility. Golf fitness is no longer a joke. It’s here to stay- get with the program or get left behind. The golf posture is an athletic position. The golf swing requires balance, speed, flexibility, core strength, hand-eye coordination, and endurance- to be repeated from 70 to who knows how many times per round or practice session. You add to that external conditions such as weather- like Summer-time down here in Texas. In the world of golf, there are any number of gadgets and products being sold with guarantees of “adding 30 yards instantly” or “drop 10 strokes overnight”. But, nothing approaches being able to get your body in the correct golfing posture and position- thereby giving you the best chance to hit the ball where you intend and score comparable to your ability. Getting yourself in these positions requires that you have a basic knowledge of the golf swing and also at least a basic level of fitness to execute the golf swing. It should go without saying that the greater your understanding and your fitness- the better you will score on a consistent basis. That’s where a golf-targeted fitness plan can come into play. Golf fitness not only benefits those of us on the younger side, but also those with a little more seasoning. Clear benefits can be derived by those between the ages of 55 and 75 by participating in a strength and flexibility training program. And the gains from these fitness programs extends to life beyond the golf course (3,4). The serious golfer of today, conditioning and general fitness should no longer be seen as “optional”. You will get left in the dust by your budies or playing partners if you take this approach. One thing you want to make sure of is that you are doing some sport-specific training in the context of your overall fitness regimen. In our case, that will be golf fitness.